(Chris Detrick | The Salt Lake Tribune) Diners eat at the New Yorker Restaurant on Thursday, Sept. 17, 2009. Elegant, classy and an irreplaceable piece of Salt Lake City’s dining history. Those are some of the memories Utahns have of the New Yorker Restaurant, which abruptly closed this month after an impressive 40-year run. The closure marked the end of an era for many Utahns. For some, the New Yorker was the special-occasion restaurant where family celebrated important milestones — birthdays, weddings, anniversaries and promotions. Others were employed at the restaurant during college and talked of the notable Salt Lake City faces that came to dine, often before a performance at the nearby Capitol Theatre or Abravanel Hall. A few lamented the demise of yet another longtime Salt Lake City eatery. The New Yorker has joined Lamb’s Grill, Bill and Nada’s and the Cinegrill, among others, on the closed list. Tom Sieg and business partner John Williams opened the private club in the basement of the old New York Hotel, 60 W. Market St., in 1978. They brought a third partner, Tom Guinney, into the fold in 1980. 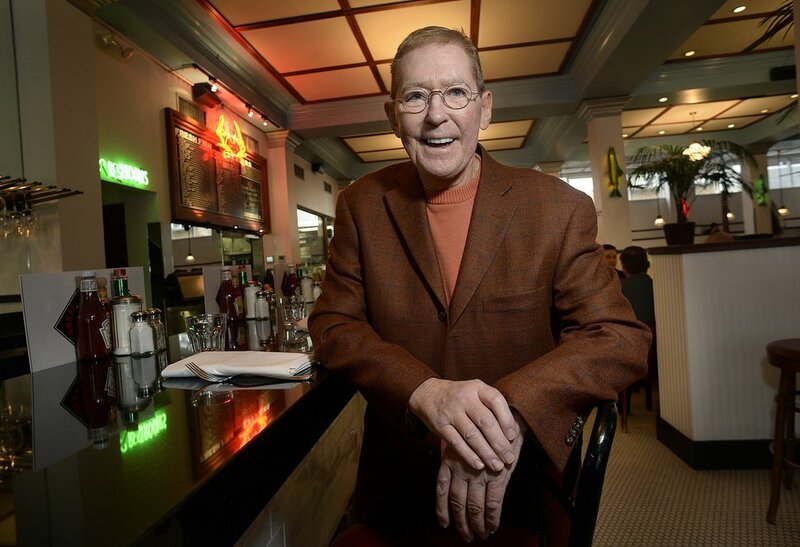 Eventually, the three formed Gastronomy Inc.
Scott Sommerdorf | The Salt Lake Tribune Tom Guinney joined the Gastronomy restaurant group in 1980, two years after original co-founders John Williams and Tom Sieg opened the New Yorker. Some 38 years later, Guinney is the last surviving member of the trio. Sieg died in 2008 and Williams was killed in a house fire in May 2016. The trio hired a well-trained and respected chef, Upton Ramsey, who created a gourmet menu similar to what you might find in New York at the time — with names to match, like the Big Apple hamburger and the Park Avenue, an open-faced crab sandwich. There was a different quiche every day, and the most popular dessert was the frozen chocolate mousse, called the Frango, Judy Cullen, who started working at the New Yorker as a waitress in fall 1978, said in a telephone interview. The savvy owners also worked with arts organizations to bring many of the top performers coming through Salt Lake City to the New Yorker. From Gene Kelly and Liza Minnelli to Luciano Pavarotti and Joe Namath, all enjoyed a meal in the swanky private club. Utah leaders and celebrities were regulars. Former Salt Lake City Mayor Deedee Corradini was there so often that she earned a plaque at her favorite table. Robert Redford dined there, especially when he was trying to launch his Sundance Institute, said Cullen, who worked her way up the Gastronomy ranks. She left in 2012 after 34 years of service. Part of that can be attributed to Sieg, who was the face of the New Yorker. He had his own chair at the bar and welcomed everyone who came down the steps into the speak-easy-like setting. Hebda was one of several Salt Lake Tribune readers who sent in memories of their time spent at the New Yorker, which became a restaurant in 2009 when the state did away with private clubs. (Chris Detrick | The Salt Lake Tribune) Diners eat at The New Yorker restaurant Thursday, Sept. 17, 2009. Much of the New Yorker’s charm was the 1940s Art Deco interior, with its stained-glass ceiling and luxurious banquettes — elements that had been brought over from the historic Hotel Utah. “It was a CLASS place,” wrote Cathy Nuesmeyer, who usually dined at the New Yorker as part of her downtown job. “It was usually for a special occasion, a business meeting or birthday,” she said, singling out “the elegant atmosphere and desserts” as reasons she will miss the restaurant. Former television reporter Craig Wirth still has his membership card, a reminder of numerous memorable meals. “It is unbelievable that a restaurant could deliver incredible food, service and atmosphere every time, but it did. It was where I went if I needed a perfect place and meal for either a social or business occasion,” he said, adding that before the New Yorker’s opening, he covered his first murder at the New York Hotel. “I remember when you had to have a membership to get in, and that seemed so suave and fancy to me,” wrote Lehi resident Andrew McCormick. He specifically recalls a December night in his 20s. He had borrowed his grandmother’s New Yorker membership card to take his girlfriend (now wife) to dinner and the ballet. “I honestly don’t remember the meal,” he said, “because when we got out to my car, the water from the car wash had frozen inside the locks, and I couldn’t open the doors.” He wandered back to the restaurant and asked to use the telephone — this was before cellphones — where the host and maitre d’ saved the day. As Salt Lake City continued to grow, newer restaurants overshadowed the New Yorker. Then, last month, the Salt Lake County Health Department announced that as many as 650 customers who consumed food or beverages at the New Yorker may have been exposed to the hepatitis A virus. It was likely the final straw for Guinney, the last surviving member of the ownership trio. Sieg died in 2008; Williams was killed in a house fire in 2016. Since announcing the restaurant’s closure, Guinney has placed all the New Yorker employees who wanted a job — including Pliler — at Gastronomy’s Market Street Grill restaurants in downtown, Cottonwood Heights and South Jordan. The Spoor sisters, Cindy and Molly, aren’t sure how they will spend Christmas Eve this year. They always went to the New Yorker on Dec. 24. And friendships are never forgotten.